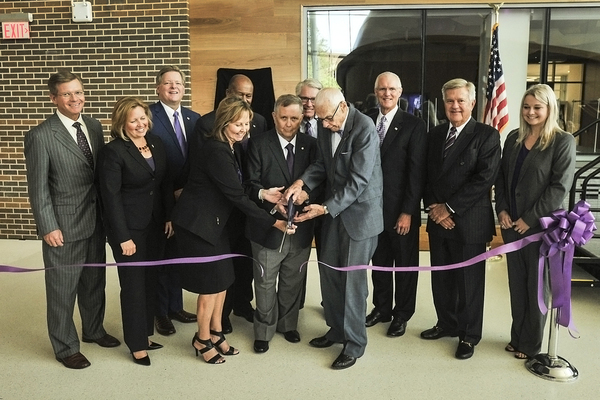 In conjunction with their quarterly meeting, Stephen F. Austin State University regents participated in a ribbon cutting to celebrate the opening of the Ed and Gwen Cole STEM Building. Pictured from left are SFA regents David Alders of Nacogdoches, Karen Gantt of McKinney, Dr. Scott Coleman of Houston, Brigettee Henderson of Lufkin and Alton Frailey of Katy; Dr. Baker Pattillo, SFA president; SFA regent Bob Garrett of Tyler; SFA benefactor Ed Cole; SFA regents M. Thomas Mason of Dallas and Ken Schaefer of Brownsville; and SFA student regent Kate Childress of Lumberton. Approximately 1,000 guests attended the event and were able to tour the building and observe demonstrations of the state-of-the-art instrumentation and laboratories. NACOGDOCHES, Texas - Stephen F. Austin State University regents approved an initiative during its quarterly meeting Tuesday that will utilize alumni and industry professionals to assist in providing transformative experiences for students. SFA recently became the second Texas institution to offer a specialized degree in banking, and now, students enrolled in the Chadwick family banking program at SFA will have the added bonus of an advisory council. Chadwick family banking program advisory council members will serve as a link between the classroom and the banking and financial services industries, while also providing mentoring opportunities to students. "Industry engagement is an essential part of all we do in the Rusche College of Business, and it is especially important for the Chadwick family banking program," said Dr. Tim Bisping, dean of the Rusche College of Business. "This advisory council will be an invaluable tool as we work to stay abreast of the latest developments in the banking industry in order to ensure graduates are successful in launching their banking careers." Council members will seek to strengthen educational opportunities for students and build relationships between the university and industry professionals. Dr. David Kaiser, director of the Chadwick family banking program, said this endeavor will help ensure students seeking a Bachelor of Business Administration in banking graduate with the knowledge and skills necessary to succeed. "This council will help us build and maintain pathways for our students into the industry upon graduation," Kaiser said. Regents also approved five new courses to strengthen curriculum: international and intercultural communication - China; forecasting in economics and business; publication management and production; a publishing capstone course; and a practicum in professional and ethical practice. These curriculum changes will be sent to the Texas Higher Education Coordinating Board and the Southern Association of Colleges and Schools Commission on Colleges for further approval. Regents approved an institutional operating budget totaling about $265.8 million for 2018-19. The budget reflects a 4-percent pool for merit salary adjustments and targeted strategic initiatives. The board approved a capital plan budget of about $10 million for 2018-19. This budget follows goals outlined in the campus 2020 master plan, strategic plan and space assessment, which includes campus infrastructure, information technology services equipment, system and security initiatives, and planned maintenance renovation projects. Improved academic support, student life, safety and capital renewal initiatives are all targets of the capital plan. Sand volleyball courts, which will allow SFA to offer a NCAA beach volleyball team, also are among the goals. "Our goal is to increase the number of sports available to our female students," said John Branch, assistant director of athletic external affairs. "Beach volleyball is a popular sport and will make us competitive with peer institutions. We hope to be ready for competition by spring 2020." Classrooms also will undergo technology upgrades to enhance instruction, and the number and capacity of virtual desktops will increase to provide greater access to high-quality graphic software. For the James I. Perkins College of Education, the first-floor lobby areas in the McKibben Education Building are scheduled for renovation. In the Forestry Building of the Arthur Temple College of Forestry and Agriculture, about 45 workstations in the forestry geographic information system lab will be replaced. In 2016, SFA added a crop science course into the core curriculum that accelerated the need to build a new greenhouse at the Pineywoods Native Plant Center. At the board meeting Tuesday, regents approved a $20,000 project budget increase to construct the 7,200-square-foot, three-bay, gutter-connected greenhouse. Regents approved conducting an architectural assessment of property at 1401 N. Mound St., previously owned by Kay Bailey Hutchison, former U.S. senator and permanent U.S. representative to NATO. A space assessment was conducted by the San Antonio-based firm Facilities Programming and Consulting, with recommendations for use of the historic home located on the property. A comprehensive architectural design plan will be developed in accordance with those recommendations. The board received updates from Dr. Baker Pattillo, SFA president, regarding the university's 95th anniversary celebration, which will take place Sept. 18. Richards Carlberg delivered a report regarding the university's marketing campaign, and Bentz Whaley and Flessner gave an update on the university's fundraising campaign. Additionally, regents heard reports from Dr. Buddy Himes, dean of the College of Fine Arts; Karen Gantt, chair of the Champions Event Committee; Craig Turnage, executive director of alumni relations and the SFA Alumni Association; the Faculty Senate; and the Student Government Association.